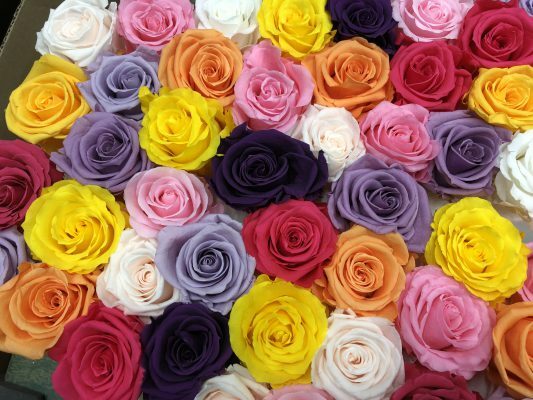 Preserved Roses are a great way to express your everlasting love for all the mothers in your life on Mother’s Day. 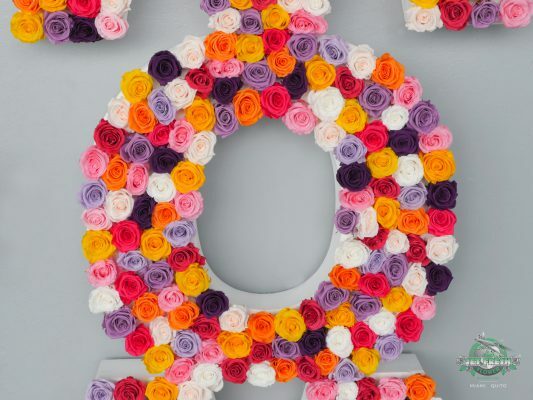 Jet Fresh Flower Distributors is getting into the holiday spirit this season with a custom-made Mother’s Day display using only Preserved Roses. 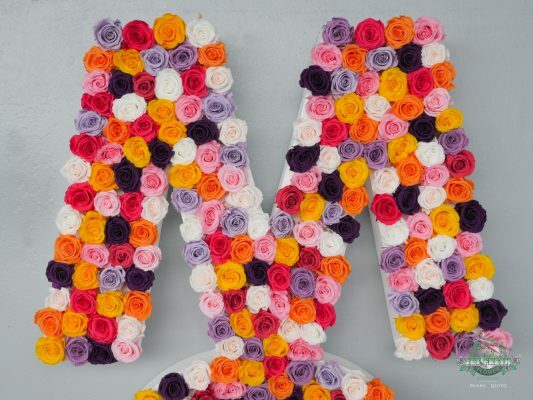 The marketing team with Olga covered large, white styrofoam letters with preserved roses to spell out the word “MOM.” Using preserved roses from Colombia Farm A, according to our Preserved Flower Brochure, we used a great assortment of standard-sized roses in several different colors to fill the display and create a longer-lasting, rainbow assorted arrangement. 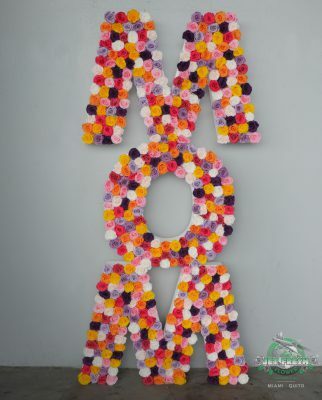 Altogether, the “MOM” display measures 88×24 inches horizontally. 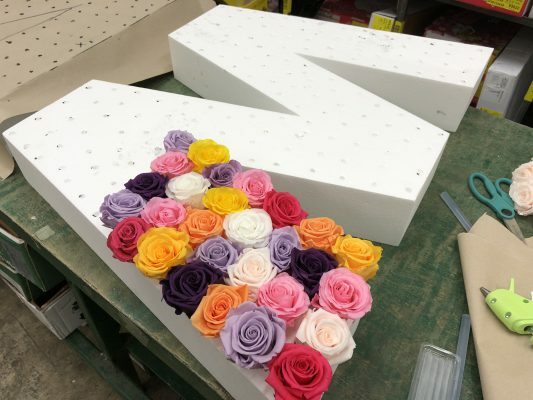 We covered one side of the letters with standard-sized preserved roses that measuring approximately 4.4-5.5cm, and used a hot glue gun to hold them in place. Due to the styrofoam’s thickness, Ryan indented holes into the foam using a pencil-wide stick and a mallet. For efficiency, he laid out the spacing of the roses in advance so Olga and I could quickly glue and design them. In certain cases, new holes were added during the gluing process to make sure the spacing was completely filled. The slight range of rose sizes can affect the initial layout of your design, so don’t be afraid to modify your spacing along the way. The holes will be covered anyway. Applying hot glue directly onto the styrofoam caused the styrofoam to lose stability and melt right through. Instead, we suggest applying the hot glue directly onto the rose stems and then placing them inside their respective holes. It helps to hold the roses in place while they start drying. That way you can ensure the roses are facing in the right direction before they dry leaning the wrong way. Colombia Farm A has a lovely collection of preserved roses for your special events, gifts and more. 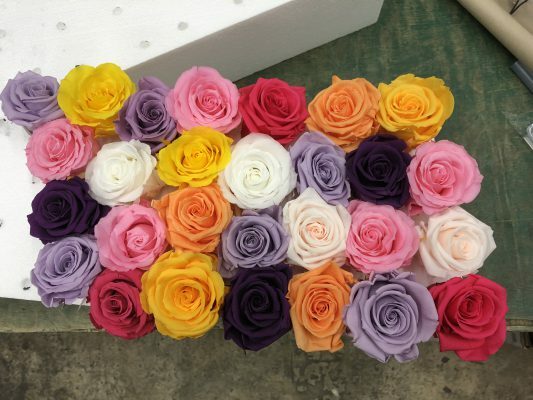 Flower walls, hat boxes, corsages and more can be designed using preserved roses. These real roses are preserved at the farm in Colombia maintaining their natural appearance without appearing or feeling like silk. Explore some of the colors available from Colombia Farm A, and see the rest of our catalog: Preserved Flower Brochure. Jet Fresh Flower Distributors is located near the Miami International Airport, and will be opened everyday until Mother’s Day fulfilling your last-minute flower needs. 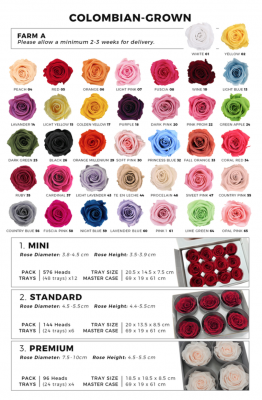 Stop by our Cash & Carry to pick up Preserved Roses by the tray or master case, or call for last-minute FedEx ordering. Give us a call at (305) 499-9144 or Sales@JetFreshFlowers.com. This entry was posted in News, Preserved Flowers and tagged Design, DIY, Mom, Mother's Day, Preserved Flowers, Preserved Roses.